We are very excited about our recently introduced preview of Power BI Q&A. With Q&A, you can ask questions about your data in your own words. Among other UI improvements, we added the option to provide feedback in context, so you can let us know how you feel about the answers you get from Q&A. Just long-tap a chart or other result, then tap the smiley or frowny face. Your anonymous feedback is highly appreciated and will help us improve the answers you get, so keep them coming! Need help getting started? See our Q&A documentation. With the new 3D touch integration, you don’t need to launch the Power BI app to perform common actions. Just deep-press the Power BI app icon on the home screen of your iPhone 6s or later to access notifications, search, and recently used dashboards. 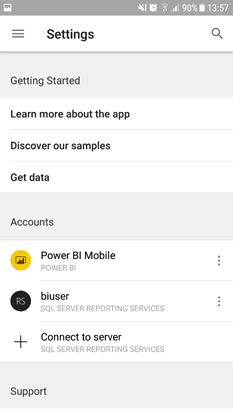 Now you can connect to up to five different SQL Server Reporting Services (SSRS) servers at the same time on your Android device. (This feature is already available for iOS devices.) 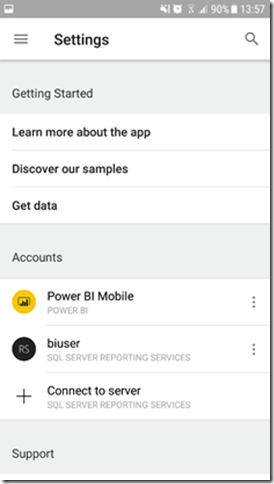 Until recently, to connect to different SSRS servers from the Power BI mobile apps meant disconnecting from one server so you could connect to another one. With this update, you can have up to five connections to SSRS servers at once, and all them will be available from the Settings screen. When you scan a QR code for a tile in a dashboard that’s not shared with you, you can ask the dashboard owner for access directly from the Power BI app. We’ve improved touch interactions for time slicers and fixed a bug for time slicers in focus mode.